Looking up his career stats, I learned Ike, after graduating high school in Louisiana, always hit .300+ while moving from Class D through Class AA teams in the Yankees’ system, but was never called up to New York City. In 1965, Ike went to the Cardinals’ AA team in Tulsa, and then several other farm systems through 1967, when he retired from baseball at age 26. When I wrote an email back to Ike, he told me the Richmond Virginians, the Yankees’ AAA affiliate, played the Yankees on Sunday, April 12, 1964, at Richmond’s Parker Field, to end 1964 spring training: that was the game he referred to in his comment. 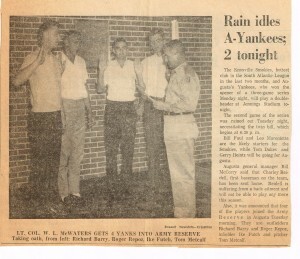 Ike sent along files of the Richmond Times-Dispatch’s coverage of the game, and added that he was organizing a summer reunion of many of the early ’60s Yankees, including Jim Bouton and Art Lopez, in Greensboro, North Carolina, on July 18 and 19. If you’d like to check it out, the reunion will be hosted by the Marriott hotel in downtown Greensboro, with a tour of War Memorial Stadium on the morning of the 19th and the Greensboro Grasshoppers’ game that evening as the main events of the reunion. I used the opportunity to ask Ike some questions by email about what it was like to be in the Yankees’ organization in the closing years of the franchise’s multi-decade dynasty. Here is our exchange. Do you think there was a greater gap between the minors and MLB when you played than there has been for say the past decade? In terms of the quality of play and how hard it was to get to MLB, and also what you could call the cultural difference between being in the minors, riding buses to minor-league parks, and being in MLB, flying from stadium to stadium? Maybe the gap was greater in the late ’50s/early ’60s if you were in the Yankee organization than if you played in another organization. 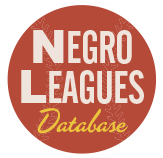 When I played in the Yankee organization from 1959-1964 there were only 16 teams in the Major Leagues, 8 in National League and 8 in American League. Each team was limited to a 25 man roster for a total of 400 jobs in the Majors. 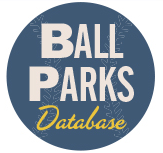 Now, after expansion, there are 30 teams for a total of 750 jobs in the Majors. The math tells you how hard it was to get to the Majors in the ’60s, especially in the Yankee organization. 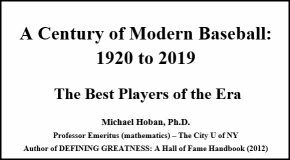 They were winning the pennant and World Series every season and regardless of how good you were you only moved up one classification at a time if you were lucky. I like to think I am a good example of that. After signing with the Yankees in 1959 out of high school they optioned me to their class D Rookie League. I won the batting title and made the All-Star team. That got me a promotion to the class C California League where I again made the All-Star team and hit over .300. That continued through the 1964 season, hitting over .300 and making the All-Star team. Unfortunately, being an infielder I was playing behind Bobby Richardson, Clete Boyer and Tony Kubek. The 1964 season was the beginning of the end of great Yankee dynasty for the next 11 seasons (see Marty Appel’s book, “Pinstripe Empire“.) The ’65 Yankees were all of a sudden, it seems, riddled with injuries and decline of stars like Mantle, Maris, Kubek and others. The Minor League system was in disarray. Most of the guys I played with during my six years in the Yankee organization were frustrated and quit or got released. I was traded to the Cardinals for the ’65 season and a few of the guys finally got called up. Roger Repoz, Pete Mikkelsen, Mel Stottlemyre, Dooley Womack. The decline of the Yankees and their Minor League system continued as owners Dan Topping and Del Webb prepared to sell the team to CBS. Also the amateur draft, started in 1965, hurt the Yankees more than most teams because it temporarily negated the Yankees’ willingness to spend. The difference in the quality of play between the Minor Leagues and Major Leagues was very little. I played with and against some of the best players in baseball in the Minors. 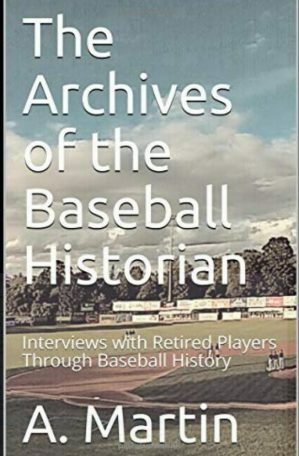 Tony Oliva, Pete Rose, Tony Perez, Mel Stottlemyre, Bobby Cox, Phil Niekro, Carl Yastrzemski, Willie Davis, Ferguson Jenkins, Jim Bouton and many more. In just the ones I’ve listed here you’ve got a Triple Crown winner, Major League batting titles and Hall of Famers. As far as cultural differences in the Majors and Minors it was worlds apart. Long bus trips breathing diesel fumes, playing in dim lit stadiums built in the ’20s with 500 people in the stands. But the long bus trips were the only thing I didn’t miss after I stopped playing baseball. Other than that, it was a great ride! Were you in awe of Mantle, Maris and the other Yankees when you saw them in spring training? Or was there a reaction of “they’re not much better than me, I can make it if they did”? Not so much by that point in my career. I was playing my sixth and final season in the Yankee organization in 1964 and had played with some of the guys on the team — Pete Mikkelsen, Joe Pepitone, Al Downing and Archie Moore. I was in awe of them though in 1959 when I was a senior in high school watching them on a 12″ black and white TV. Mantle, Hank Bauer, and Norm Siebern in the outfield — Boyer, Kubek, Richardson, and Skowron on the infield and Yogi catching. Their starting pitchers of Whitey Ford, Don Larson, Ralph Terry, Art Ditmar and Bob Turley. Jim Coats, Bobby Shantz and Ryne Duren in the bullpen. Those guys were in their prime at that time and I never dreamed that a few weeks later I would be playing in the Yankee organization. 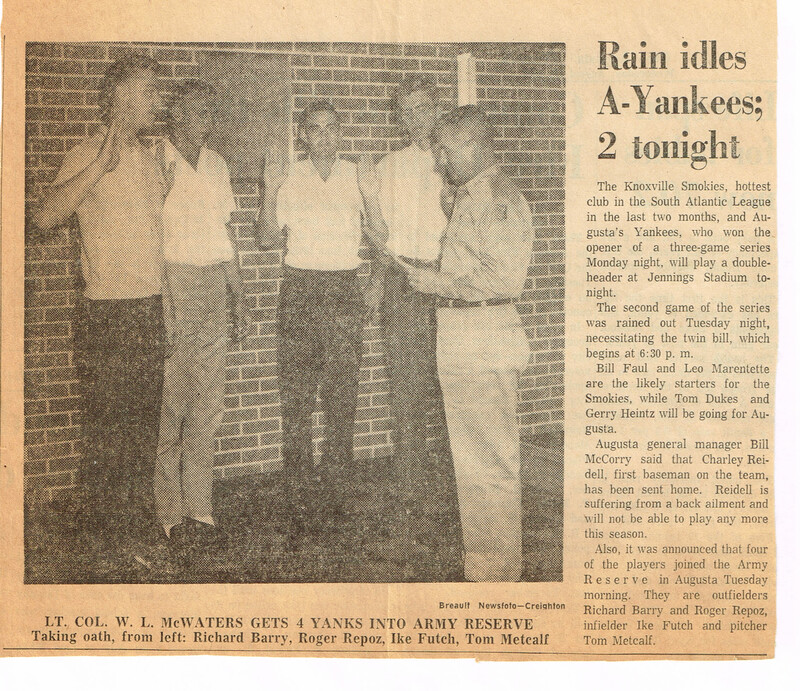 I had actually met some of the Yankee players in spring training of 1963. Tom Metcalf, Roger Repoz, Rich Barry and I served our six months of active duty between the ’62 and ’63 seasons. We reported to the Yankees for assignment since spring training had already started. When I walked into the clubhouse Mantle was the first one to come over and introduce himself. They were all nothing but gentleman and treated us as peers. In that exhibition game in Richmond, Mantle and Maris, Ford, Howard and the rest — they were making a rare, perhaps their only, trip to Richmond. With so few games on TV, and the Senators and Orioles the only somewhat nearby A.L. teams, some of the people at the game must not have seen those Yankees play again. Did you get the sense that the Yankees made a point of putting their best players on the field and telling them to play hard, whether out of pride or from the feeling that the Richmond fans deserved nothing less? Also, in your experience, were the Yankee players condescending and haughty, or did they treat the Richmond players as colleagues? The Yankees did make it a point to put their best players on the field to start the game. The only player in their lineup that wasn’t one of their starting eight position players was Phil Linz and he replaced Tony Kubek who had a bad back. The starters played at least six innings. Al Downing and Ralph Terry were the pitchers and both were in the starting rotation for the Yankees that season. It’s true most of the fans didn’t get to see the Yankees play again that season but they did watch the Richmond team and Art Lopez, Jake Gibbs, Mel Stottlemyre and Tom Metcalf went up to the Yankees for the ’65 season. Phil Linz, Tom Tresh, Joe Pepitone and Al Downing played at Richmond the year before. Most of the 12,000 plus crowd was waiting after the game for autographs and Mantle must have signed several thousand that night. They got their moneys worth. The Yankee players were anything but condescending and haughty. They treated us young players with respect and wanted to make us feel like we belonged there. As I mentioned before, the first time I was in the Yankee clubhouse and talking to Pete Mikkelsen Mantle walked over and introduced himself. Baseball was nothing like the NFL with all the hazing and harassment the vets gave their rookies — making them get up on a table and sing, carry their luggage, going out to eat and sticking them with a $30,000.00 tab.